In the 14 months since Earl Thomas asked the Cowboys coach to “come get me,” much has changed with him and the marketplace — not in his favor. 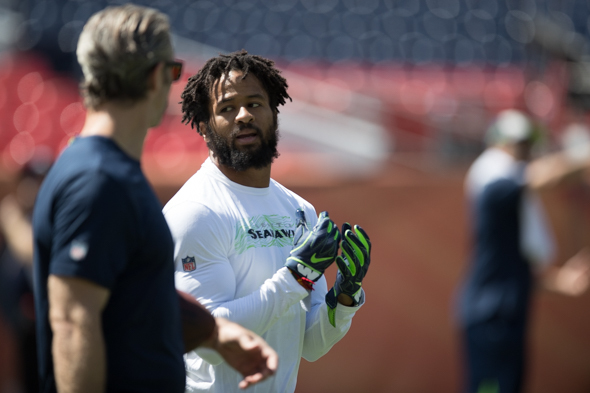 In several ways, Earl Thomas is a unique player — the best combination of speed and strength at the free safety position, enhanced by a commitment to study that makes him even more formidable on the field. His nine seasons of intense achievement as a Seahawk have made him, when the day comes, a first-ballot Hall of Famer. Thomas often says (and gestures) what he thinks without regard to, or awareness of, consequences. How much that has played into his imminent departure from Seattle when NFL free agency commences next Wednesday is unclear. But the more I think about Thomas’s “come get me” episode after the December 2017 defeat of the Cowboys at the Clink, the more I think he crossed a line of incorrigibility for coach Pete Carroll, somewhat in the manner of Richard Sherman. Carroll likely will never say how frosted he was by Thomas’s foolishness. Post-game, he talked around it. As usual, Thomas didn’t talk around it. “I went to the locker room to talk to Dez (Bryant), and I saw coach Garrett, and you know, I’ve always been a Cowboys fan growing up,” said Thomas, a native of Orange, TX. “The biggest thing when I say, ‘come get me,’ is I don’t literally mean ‘come get me now,’ you know? I’m still in the prime of my career — I still want to be (in Seattle). I don’t recall seeing a similar move from a pro athlete in any team sport — lobbying publicly, in uniform, to the coach of the team he just helped beat, to hire him. Granted, he didn’t mean “now.” And while I salute any athlete’s honesty and candor, Thomas needed to be a businessman instead of “just who I am.” The episode was the first in a series of unfortunate events that have helped to compromise his pending free agency. Subsequently, Thomas took the futile action in his contract year of holding out of off-season drills, training camp and the preseason despite having zero leverage. He ignored the lesson from the same decision made by teammate Kam Chancellor, who got nothing from his 2015 holdout, as well as the lesson from Sherman’s confrontations with the coaching staff that led to a willingness by Carroll in 2017 to trade Sherman at the apex of his career. After being fined for his contractual absence (it’s unknown whether the Seahawks enforced the penalties), Thomas returned to the Seahawks for the start of the 2018 season to avoid missing the game checks from his $8.5 million salary. But his season lasted four games until the worst thing happened than can happen to a player in his contract year — a season-ending injury. But the broken leg, his second, isn’t career-threatening, as far as is known. What is a threat to his desire to be the highest-paid safety in the game is a mass of quality veteran safeties populating the marketplace, and the changing nature of NFL defenses responding to the heavier use of the short-pass game. Joining Thomas in free agency are premier talents such as Landon Collins, Tyrann Mathieu, Ha-Ha Clinton-Dix and Eric Weddle, all let go primarily because they were too expensive. But if the tweet by The Athletic’s Calvin Watkins is accurate, the safeties market is shrinking. The change isn’t only because of price. College-style spread offenses are creeping into NFL playbooks. The NFC West is likely to see the boldest encroachment yet when the Arizona Cardinals’ new coach, Kliff Kingsbury, an Air Raid quarterback for three years under coach Mike Leach at Texas Tech, brings the full circus. Heisman Trophy winner Kyler Murray is speculated to be Klingsbury’s choice for the Cardinals’ No. 1 overall pick. The countermeasure on defense is the increasing use of six or seven defensive backs at a time. That means secondaries need more roster spots dedicated to talent that is younger and cheaper than the quality veterans. Fomer Sportspress Northwest colleague Doug Farrar, now with USA Today (and author of the must-read new football book, The Genius of Desperation) talked to Carroll at the combine in Indianapolis last week about how defenses are adapting. “We’re seeing defensive backs all over the field,” he said. “The linebacker spot for sure, you can see it. That’s because of the nature of the offenses they’re facing in college. The field is spread out. This is nothing new, we’ve been talking this way for years, but more than ever, defenses are making the decisions to play guys that are more like defensive backs. If that market-changer isn’t enough, the group of safeties entering the draft is considered by many scouts to be the best in years. Having said all that, some team is going to hire Thomas. Hey, he won’t be 30 until May. But in the 14 months since he forecasted, correctly, that Seattle was going to kick him to the curb — an outcome he helped induce — the curb isn’t in the same ritzy neighborhood. Nor is it as heavily trafficked. The marketplace, and the cruel fates of the ruthless NFL, change quickly. When choosing options, it is best to avoid the option signaled by the middle finger. Does Seattle get any compensation is he signs with another team after being a FA? With this many safeties available combined with Earl’s mouth, it will be interesting to see who signs him, for how long and for how much. It’s your misfortune and non of my own, good luck Earl Thomas. Thomas expressed himself the same way Joanna did at Chochkies, and both were gone. The Seahawks and Chochkies (assumedly) both continue to flourish without them. Such are the legacies of the NFL and flair. Thomas knows one way. But most of life is about learning how to feather the throttle. I believe you nailed it, Art. In my opinion, the middle finger was the more prominent reason for Thomas bring “kicked to the curb” than the “come get me” remark. When a player directs an obscene gesture to his coach (who else could it have been directed at? ), it would seem to be the moment when the bridge is burned. As you said, some team will hire Thomas. His talents are just too formidable for him not to be in demand. But I doubt that he will succeed in becoming the highest paid safety in the NFL. Sad. Given that Thomas knew his season was done as soon as it happened, I think Carroll might have cut him some slack. What we don’t know is the subsequent dialogue between coach and player. My guess is those words sealed his fate. It’s hard not to wonder if that lack of impulse control—“come get me,” the finger—is not somehow related to Earl’s instinctual play and success on the field. Honestly, I think most people would forgive it if he’d simply apologize. That’s really the defining act that would mark the difference between his impulse and his character. But, it seems, apology is so passé. I don’t know if it’s a generational thing or the zeitgeist, but these days some warped sense of “pride” seems to always, um, trump self-awareness and admission of one’s lapses. When I was a kid, an honest apology for a clear wrong was an honorable thing to do, a step to manhood. What happened? What happened? Too many 1 and 2 child homes where they are treated as the world’s best with no need to apologize and be held accountable, where they are continually in an atmosphere of no consequence and living in a world of “participation trophies”, etc. They are enabled to only think of themselves and are used to getting their way without competition from other siblings or friends. Living in a sheltered cocoon does that. Next time you’re in Compton, or Orange, TX., write me about the sheltered cocoons you find there. 1cool…I think you may want to backtrack that. Uh….I’m not thinking Earl got participation trophies…I do think your rant says much more about you than anyone else. I’d stay away from sweeping negative generalities, especially like 1coolguy’s below. What I can say is that Thomas and Sherman are totally different personalities, but they and other premium athletes often share an arrogance that helps make them successful. It’s a trait in success, but it has the downside of an an inability to accept responsibility for error. I’ll defer to your expertise on the successful sports personality, Art. But that middle finger was hard to take from someone who I enjoyed so much as a player. And maybe I (and others) unfairly or unconsciously tie it in with our current coarse political culture and leap to cynical generalities. We can all do better, right? Tor5, you’re entitled to your feelings. Many fans were disappointed in Thomas. It was a foolish thing for him o do, and he has yet to apologize. It certainly felt like another episode in the coarsening of our culture. But I think Earl would have done that regardless of politics. As I wrote, he has no filter. Nice stuff. Angry Earl Thomas is going to play with a chip on his shoulder for some team next year, but it won’t be for $10,000,000. And it won’t be a long-term deal. And it’ll be full of incentives. And unless it’s for the veteran minimum, it won’t be for his beloved Cowboys. If he plays, I think he’ll be great, at least until he gets hurt. My guess is he’s thinking about eating some worms (as the ditty goes) but as you say, he brought it on himself with a simple extension of his digitus medius. Sorry…sometimes I get a little obscure. Roxanne, with Daryl Hannah and Steve Martin. I wish Earl the best. His reckless disregard for everything is one of the reasons he’s a generational talent, but it’s unfortunate he can’t keep it on the field. Sadly, as an Earl fan, he’s screwed. Aside, a discount Eric Weddle would look good in a Seahawks uniform. Weddle is 34, and Carroll hasn’t had much success in teaching his techniques to veterans. True, and he’s a Ram now. Hope he’s out of gas. Mr. Thomas wanted protection against injury. He didn’t get it. He got hurt. It’s a violent, heartless business reminiscent of the thumbs down Roman Coliseum Gladiator games. European and South American style football is as popular there as ours is here. The difference? Very few participants sustain serious injury. We missed Earl Thomas on the next, and every series to follow, after he was carried from the field. Given the circumstances, was the salute the appropriate gesture? What was he supposed to do? Stand for the National Anthem? Might the outcome be better for everyone if the league gives all players the protection against industry they deserve? He most likely has an insurance policy to protect him from injury. Brian Bosworth took out one through Lloyds of London to ensure he’d retain his salary for example. Good thing he had it. Earl probably has something like that. His contract demands now is IMO just trying to get the most he can because he knows his next contract will probably be his last. Agents usually don’t like to see players funding their own risk by paying exorbitant premiums. It happens, however. Earl may find himself going year to year to the highest bidder from here on. It’s up to the players and their union to fight for more guaranteed money in the next CBA. Market forces have some influence right now — Kirk Cousins got $84M all guaranteed, yet only three years — but the most dangerous sport has the least guaranteed money. That won’t change until the players are willing to strike to get it. Love Earl the player. Time to move on already. I’m wondering if Earl might sit out the season, gambling at some point a team desperate for DB help will give him the salary he wants but it never happens. An odd idea but two years ago I’d never think he’d ask to become a Cowboy while at the Clink. Go figure. With the number of Safeties available on the free agent market and the obvious points that have been made against him I don’t know if his pride will let him come down in his asking price and it’s going to have to if he wants to be on a team next season. I would rather attempt to predict the weather here this winter rather than what Earl Thomas may do.